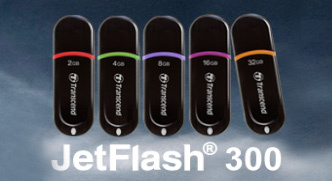 Products The ultimately compact JetFlash 300 is simple, streamlined and stylish. Drawing inspiration from deep luminous black obsidian, the JetFlash 300 has a smooth gloss-black finish, along with an adorable color band. What's more, it only weighs 8.5g and is so small that it can slide effortlessly into your pocket or purse.